"a vision of my slalom in my mind"
After last year's impressive catch up at the World Ranking, going from #41 (Jan.12) to #3 (Jan.13), Polish Michał Sulinowski is still running on that same ascending road, confirming his place in the world's Top-3 - even enjoying 7 months in a row at the #2 place! - and travelling more than ever with 26 competitions over the globe this season. With the departure of former #2 Kim Sung Jin, Sulinowski makes the most of that vacant place and makes it his own in April, upgrading of one place in the World Ranking. But he is removed in November by Korean Yu Jin Seong, who is himself ousted by Chinese Ye Hao Qin the next month, as a consequence of the latter's World Title in Battle. Sulinowski finishes the year where he started, at the #3 place of the World Ranking of Freestyle Slalom, only 19 points away from place #2, with a Best-5 of 1519 (max=1600). Classic Winner of the Hannover Inline Games, of Namwon Slalom Open and of Busto Battle, he ranks 2nd behind Lee Choong Goon, the current World Champion, at the Paris Slalom World Cup, 2nd behind #1 Romain Lebois, the current European Champion, at the XMasters Senigallia, 2nd behind Sergey Timchenko at the Rollerclub Cup Moscow, and 2nd behind Yu Jin Seong, the current World Vice-Champion, in Lishui. 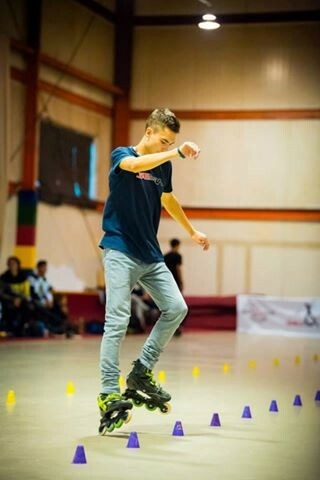 As for Battle, Sulinowski reaches 4 times the finals in 3+ cones events, finishing 2nd at the Xmasters and at Busto, 3rd in Hannover, 3rd at the European Championships and 3rd at the Rollerclub Cup Moscow. Sulinowski keeps his European Vice-Champion title, still behind double winner Romain Lebois, renewing the most important result of his previous season. He also gets the European Bronze medal in Battle. Last but not least, he adds to his list the Silver medal at the World Championships in Pair Classic with partner Klaudia Hartmanis, behind Chinese pair Guo Fang and Zhang Hao, a title reflecting their result steadiness in Pair Classic all through the year: 2nd at Namwon, Shanghai, Lishui… and at the WFSC. C.S. This year was pretty hectic with many competitions for you. What experience did you get from that year on the road? M.S. That’s right, there were so many events, especially by the end of the year, it was crazy. Of course I gain more experience with every event. My biggest problem, which I’m fighting with, is stress on competitions… It’s very difficult but I feel that it’s getting better and better. C.S. Did you still find the time to prepare and train? How did you get organized? M.S. Like I said, the end of the year was crazy. It was event after event so that I didn't even have the time to train. It was exhausting but now I have rested and I’m ready for the new year! "I didn't even have the time to train"
C.S. Do you plan to keep on with the same rhythm next season? M.S. Definitely yes! Even if it was hard, it was awesome! I also want to keep on progressing. It’s more and more difficult but it's still possible of course. C.S. Are you satisfied with your personal improvements this year? C.S. What do you plan to improve next year? M.S. I want to change many things in technique but I also want to do something new in my style. For a long time I have had a vision of my slalom in my mind and I work hard to achieve this. It particularly applies to my classic and I hope I’ll make it before the upcoming events. Keeping my fingers crossed! C.S. You renewed your European Vice-Champion title of last year, and added to it a European bronze medal in Battle and a title of World Vice-Champion in Pair Classic. Do you consider that you have reached your result objectives for this season? C.S. Any regrets this year? M.S. There is always something that may be wrong, or sometimes you can think that the results aren’t correct. But the best way to fix problems is to start with yourself. M.S. I’m very happy with those results, they just confirmed that this year was great! I’m also very proud of my first medal at the World Championships in Pair Classic with my girlfriend Klaudia Hartmanis. We worked very hard for this, despite many barriers like 600 km between us, we did it and got a nice result! C.S. A competition moment you are particularly proud of? M.S. I’m quite proud of one moment, it was during the WFSC in Taipei. Before my classic run, I was very nervous but I calmed down and managed to focus to do my classic like it was meant to be. C.S. The EFSC were held in Warsaw this year. Was is more motivating to skate 'at home'? M.S. First of all I was very proud that so big an event was held in Poland and that the organization ( janarolki.pl ) did so well! I didn’t feel any pressure that I had to win or something, but I felt big support from the Polish side! That helped me a lot! C.S. According to you, what are your qualities that explain your ranking? M.S. I didn’t think about this before and it’s difficult to type one attribute that good skaters should have. Even hard training is not enough without good pressure handling. So I think it’s all in one: hard training, motivation, mental, support and much more. C.S. Your goals for next season? Do you think you can get place #1 or #2 from Romain Lebois or Ye Hao Qin? M.S. I’ll keep the same objective as always: doing my best and seeing what happens. Indeed it’s difficult to skate with such good skaters, but for sure I won't give up! As everybody knows, everything is possible. C.S. What do you think of the new rules coming for Classic? M.S. I’m still waiting for the complete version of those rules because there is only the overview available. But it’s great to see that the World Slalom Series work hard on improving slalom. It’s like taking part in the history of this sport. Once again I would like to say thank you to the people who help, support and believe in me. Big thanks to SEBA SKATES too, for making all of these amazing things possible. And of course thank you Klaudia for being with me for better or worse. I would like to say to everybody that in all those rankings, results etc. the most important is to keep the fun and positiveness! ITW M.Sulinowski "From interesting to dangerous..."